1. To make balsamic glaze, bring balsamic vinegar to a simmer in a medium saucepan over medium heat, stirring constantly with a whisk. Turn heat down and continue whisking until vinegar thickens; this could take up to 20 minutes. Remove from heat and allow to cool completely – mixture will thicken further upon cooling. 2. Season and grill venison loin to desired liking. Slice vegetables into 2-inch matchsticks and sauté in butter until soft. Slice venison loin into 6-by-2-inch strips. 3. Place a stack of the vegetables at the end of the backstrap strip and roll up. Secure with a toothpick. 4. 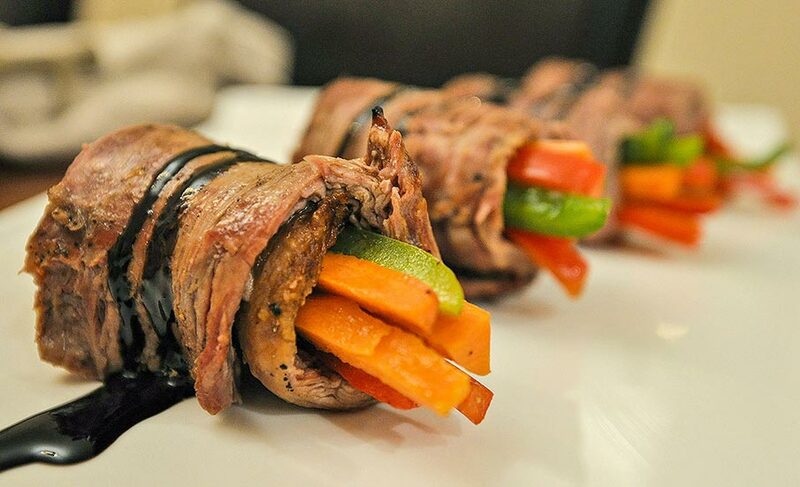 Drizzle balsamic glaze on top of venison rolls ups and serve. Enjoy!